This year's celebration at Times Square may be its most secure ever. 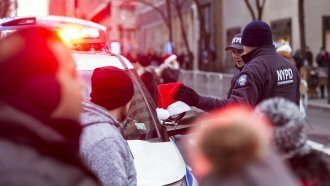 This year's New Year's Eve celebration in Times Square may be its most secure ever. Responding to 2017's terror attacks, the NYPD is increasing its counterterrorism efforts. These efforts include securing hotels and other buildings, training officers to respond to suicide attacks, deploying explosive-sniffing dogs, street barriers and blocker cars. During a Thursday news conference, New York City Police Commissioner James O'Neill said there are "no direct credible threats" to the city. The heightened security is planned out of caution. These past couple months, the city saw a terror-motivated vehicle collision, as well as an attempted explosion at a transit station. The former attack used a rented vehicle, and the NYPD is closely watching vehicle rental locations. It's unclear if these security precautions will affect the number of people who celebrate New Year's Eve at Times Square. Last year, about 2 million people were in attendance.